Enjoy three hours of ATV riding, two hours of Jet Skis and amazing views and beaches. Hop on your ATV and ride to an elevation of over 1,200′, replete with spectacular views, take pictures of a lifetime and experience the top of the world. Be adventurous! Enjoy three hours of ATV riding, two hours of Jet Skis and amazing views and beaches. We’ll start with three exciting hours on the back roads of Guanacaste’s rugged terrain. Hop on your ATV and ride to an elevation of over 1,200′, replete with spectacular views, take pictures of a lifetime and experience the top of the world. Then, its back down the mountain through your choice of beginner, medium or advanced trails to sea level and start exploring the coastline for which Costa Rica is justifiably world famous. Stop at beaches that are only accessible by ATV and enjoy a variety of different topographies, wildlife and plant life unique to each location. After the land-based portion of your outing, you can ride your ATV right up to the beach and hop on your jet ski at either Playa Potrero or Playa Flamingo. 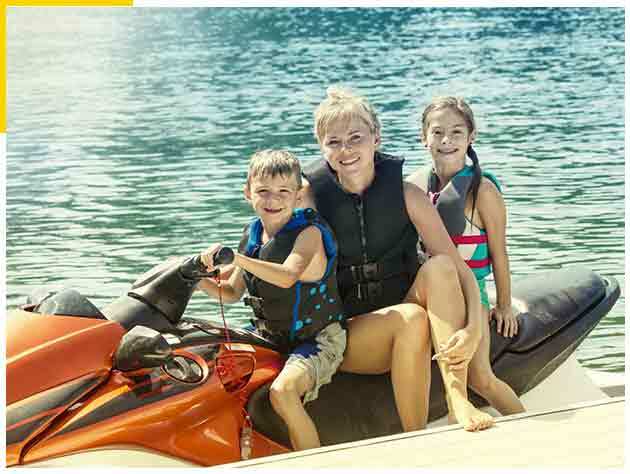 The jet ski adventure lasts two enticing hours: you’ll explore the sea, visit beaches only accessible by water, ride along the coastline and have the option to snorkel at locations specially chosen by your guide. Don’t feel like driving? Ride along as a tandem passenger on this activity for only $99. The Nicoya Peninsula of Guanacaste, Costa Rica is one of the world’s Blue Zones where people live longer and healthier … often well over 100 years old. Discover the beauty of the exciting province of Guanacaste, Costa Rica – filled with adventure and nature! The Guanacaste region of Costa Rica is named after the magnificent shady Guanacaste Tree, or “Elephant Ear Tree” – the national tree of Costa Rica. Designed by NW Ideas Ltda.